Being in such close proximity to Mount Rushmore, Rapid City, South Dakota is a well-visited city. Attracting tourists from not only around the nation, but the world, the city and the surrounding areas offers a wide array of activities, sights, and scenes for individuals and families to enjoy. From the fun family-friendly activities to the beautiful and diverse nature and wildlife found in the Black Hills National Forest just west of the city, there is no shortage of thrilling, interactive, and engaging fun to be had in Rapid City. If you’re visiting for work or for pleasure, there is always something fun to experience during your stay. But if you need a little help figuring out the best spots to hit up, individually or with a group of friends or family members, you’re going to want to keep reading to learn three of the top activities to do while in Rapid City, especially if you’ve found yourself wondering what to do in the city while you’re here. Continue reading to find out three of the best places to visit during your time in this South Dakota city. Are you wondering what to do in Rapid City with your family? Look no further than Reptile Gardens. As one of the most popular tourist places in the city, everyone in your family will love this reptilian paradise. Here you will learn about reptiles, including snakes, amphibians, and bugs. Learn the difference between venomous and non-venomous reptiles, as well as fun facts about the interesting creatures. Go on a 3D safari and pan for gold in Rattlesnake Gulch. Learn more about resident bald eagle Cheyenne, and take a look at Maniac the Giant Crocodile. You’ll have no shortage of educational opportunities, as well as loads of fun at Reptile Gardens. While many of us are interested in learning more about wildlife, including grizzly bears, elk, mountain lions, and more, we would prefer not to be directly involved with them. These magnificent creatures are beautiful and intriguing, but can also be dangerous. But are you wondering what to do in Rapid City if you’re wanting to see wildlife up close? Come to Bear Country USA. Without leaving your vehicle, you can observe in great detail wildlife in its natural habitat. Drive through a three-mile scenic route, and enjoy the beautiful, majestic sites. Calling all families looking for what to do in Rapid City! Storybook Island is the place to be if you have young kiddos who need to get their wiggles out. Created on storybook characters, there is no shortage of fun for your little ones to enjoy at this playground park. Whether you come for a day or plan or attend an event here, you’re sure to give your children a fun experience during their time at this attraction. 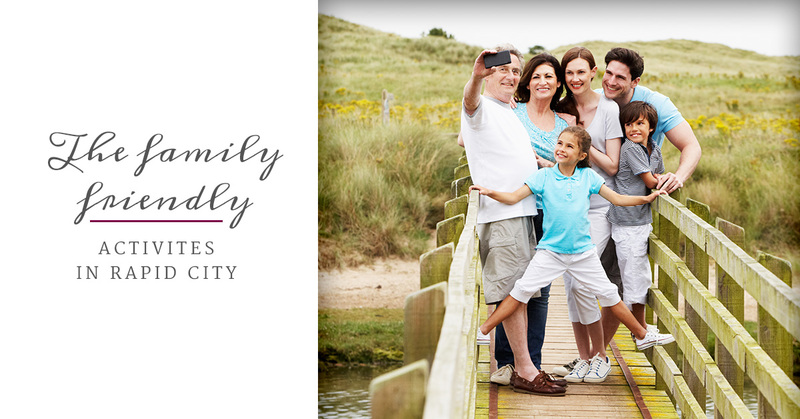 When you’re here, you’ll not only find tourists, but you’ll also get to mingle with local families. Our fun outdoor children’s playground is closed during the winter months, so if you found you and your family in Rapid City during the spring and summer seasons, take a trip to Storybook Island for a day of fun in the sun! Are you or a close friend or family member a fan of jewelry, more specifically of Black Hills Gold jewelry? Then you’ll love the Black Hills Gold factory tour. Here we take immense pride in the design and creation of our pieces, and now you can to witness firsthand the way in which we manufacture it. The name Black Hills Gold pays homage to the beautiful area from which the jewelry stems. Full of history, heritage, and art, Black Hills Gold jewelry is nothing less than exceptional. From the intricate designs to the materials used, the design of all Black Hills Gold jewelry is intricate, delicate, and beautiful. The gold found in this region shaped the Black Hills in the late 1800s. While everything else has changed, the symbol of the gold has remained the same, continuing to represent the beauty, heritage, and art of the Black Hills craftsman before our time. Equal parts educational and enjoyable, your factory tour experience will leave you feeling appreciative of the history of the Rapid City area. During the tour, you’ll get to see exactly how we perform lost-wax casting and how we cast the diamonds in molten gold. Not only that, but you’ll get to watch as we intricately and precisely cut diamonds, which are considered to be the hardest naturally occurring substance on our planet. Further, you’ll learn about the production process of our iconic grape leaf designs that are found on almost every piece of our jewelry in some way, shape, or form (hint: these beautiful leaf colors happen by alloying gold with precious metals). If you’re wondering what to do in Rapid City during your stay, don’t hesitate to sign up for a factory tour at Black Hills Gold. We are passionate about our art form and are eager to show you the steps that are taken to produce some of the finest jewelry. But wait, there’s more! When you come to visit us, you can snack on cookies and coffee during your time here. Whether you visit our facility with your family, a group of friends, or by yourself, you are welcome to take a tour of our jewelry factory with us. Learn more about our factory tours and sign up for one today. We cannot wait to see you!